This anniversary issue's tales all have their roots in earlier STF stories - Per Degaton started time-travelling in STF #2111... 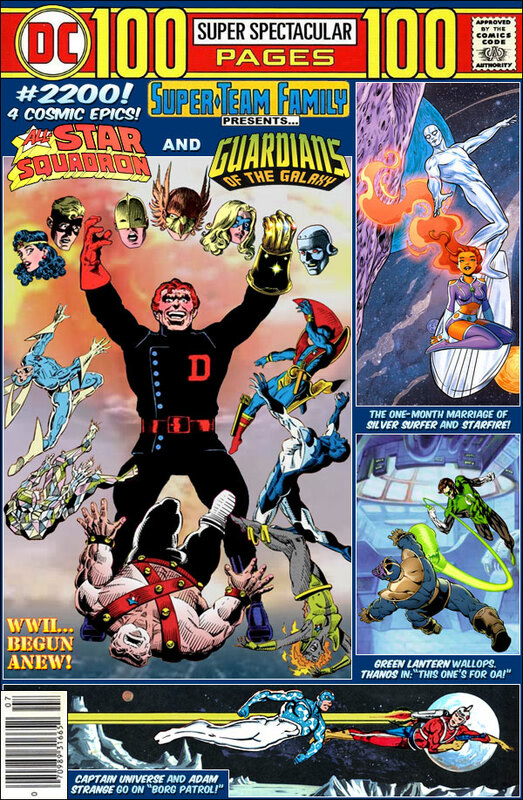 The Surfer and Starfire tied the knot in STF #397, but were already facing difficulties in STF #398... Thanos crossed the GLC in STF #1546 and Hal Jordan in STF #516... and Adam Strange first met Captain Universe in STF #865, and first assisted The Federation in STF #2056. Captain Universe and Adam Strange is obviously part one of two part one with ST:TNG, right? Great cover. "Borg Patrol," huh? Then, I guess the host body for this version of Capt. U is Jean-Luc Picard. There's no other STAR TREK character I know who would more greatly love to "remove them permanently from the equation" single-handedly! Of course, most TNG purists would point out such an act of genocidal revenge would be against his nature. Especially with his memories concerning Dawoud and the Hus'naq. Then, again, maybe Dawoud is the one who granted the Uni-power to Picard! A test of the latter's morality in the face of a Borg incursion against Rann. A feasible premise. Although, Q would be the one more likely to empower Jean-Luc, that way. After all, he first introduced the Borg to the Federation in a similarly exploitative test! Picard may be the logical choice for Captain Universe, but a more interesting one would be Data. However, given the physique, build, and coloration of the image, my guess is that it's Tom Paris. On another vibe, I'm surprised that nobody has yet noticed that Per Degaton is wearing the Infinity Gauntlet. Is that a Darwyn Cooke/Mike Allred collab for SS/Star? These big multi-story covers always take me back to my yout' and the real thing. Nice work. Congratulations on another milestone. congratulations again for another milestone, and celbrating with another great cover! I agree, these 100 page covers take me back to the days, exciting covers with several great stories both new and old! Great cover, Ross. It combines a lot that I've always loved: Silver Surfer, the All-Stars and the 100 pg specials I use to always wait for. If they ever do another Avengers/JLA I hope at least one or more pages is set in the Golden Age so we can see an All-Stars/Liberty Legion interaction. PS. Do you think you'd ever do a Silver Hawks/Silver Surfer team-up? (Or pretty much Silver Hawks/anyone, lol). I don't really remember the Silverhawks - were they a toy tie in? What about Lady Penelope and Parker with Batgirl and Alfred? Or do you remember the old cartoons where the Harlem Globetrotters met Batman? This blog could be the first time they meet the whole JLA. @Bob Greenwade: more likely a rejuvenated Picard. I mean, if Paramount can do that for/to Kirk, they can do it to/for "Old Baldy" (as Riker affectionately used to call him).